When I read Blood Music, the 1984 novel by Greg Bear, I wondered what cells might create if they were artistic, as well as intellectual (see the technovelgy entry for intellectual cell to learn more). It turns out that Professor Eshel Ben-Jacob of Tel-Aviv University and Professor Herbert Levine of UCSD's National Science Foundation Frontier Center for Theoretical Biological Physics did more than just wonder. 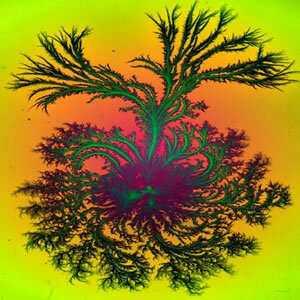 They caught bacteria in the act of creating beautiful art. "In a sense, the strikingly beautiful organization of the pattern reflects the underlying social intelligence of the bacteria. The once controversial idea that bacteria cooperate to solve challenges has become commonplace, with the discovery of specific channels of communication between the cells and specific mechanisms facilitating the exchange of genetic information. Retrospectively, these capabilities should not have been seen as so surprising, as bacteria set the stage for all life on Earth and indeed invented most of the processes of biology." 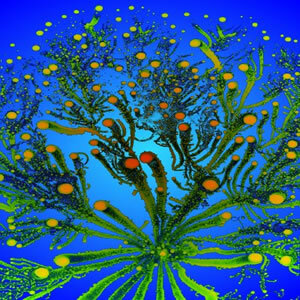 See more images at Eshel Ben-Jacob's website and read about the science in the Bacteria Art pdf. Via Bacterial Art.